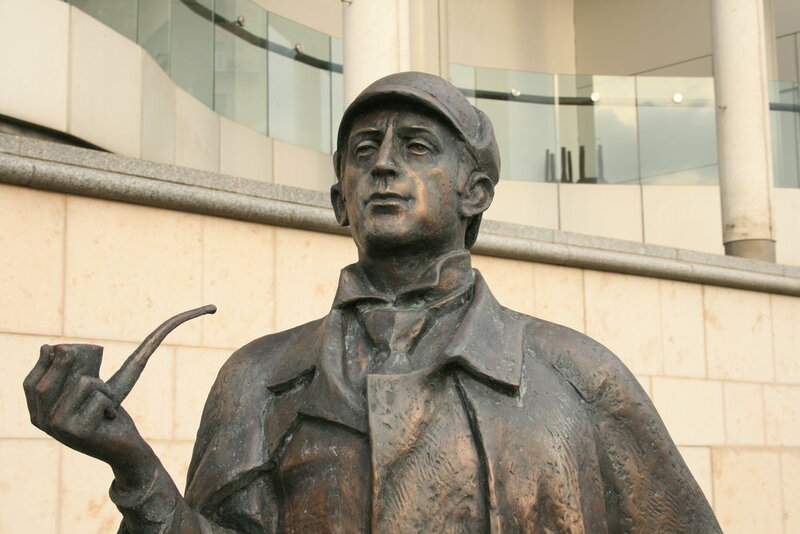 Jeremy Brett's interpretation of Sherlock Holmes remains one of the most faithful to Conan Doyle's famous detective and to the original stories. The actor became both Sherlock and his greatest advocate. Jeremy starred in made-for-television movies of two of Sherlock's most well known adventures, The Sign of Four (1987) and The Hound of the Baskervilles (1988). Additionally he portrayed Sherlock in 41 one-hour episodes of Conan Doyle's lesser known tales (1984-1993). Set in Victorian London, we are treated to the bustle of Victorian London's streets, adventures on the Thames and countryside landscapes in glorious color. In "The Final Problem" Sherlock's final battle with the villain, Moriarty, takes place amidst the breath-taking beauty of the alps and Reichenbach Falls. Jeremy performed opposite two different actors playing Dr. Watson. David Burke, in the first series, was replaced by Edward Hardwicke for the remaining episodes. Edward was so concerned about the continuity of the series, he emulated David's appearance. He even wore lifts in his shoes so his Watson would remain the same height next to Sherlock. I'm happy to say that both David's and Edward's interpretations of the good doctor were in keeping with Conan Doyle's vision of an intelligent colleague and not a bumbling sidekick that Sherlock merely tolerated. Jeremy's Sherlock sprang directly from Conan Doyle's imagination. Diagnosed as bipolar, Jeremy, no doubt, felt an affinity for Sherlock's manic highs during "the game", and dark lows between cases. Jeremy's smoking cigarettes and various pipes onscreen was just the tip of the iceberg of his addiction with tobacco. His health declined to the point that he required an oxygen mask between takes in the final Granada series. He was quite ill during some of the last episodes filmed, but did not give up. The show and the game must go on. Despite his dedication and attention to detail, Brett would be the first to admit that his interpretation was still not perfect, as no one's can be. Thank you, Mr. Brett, for bringing the true Sherlock Holmes to life.